In our Father’s mansion fair’. 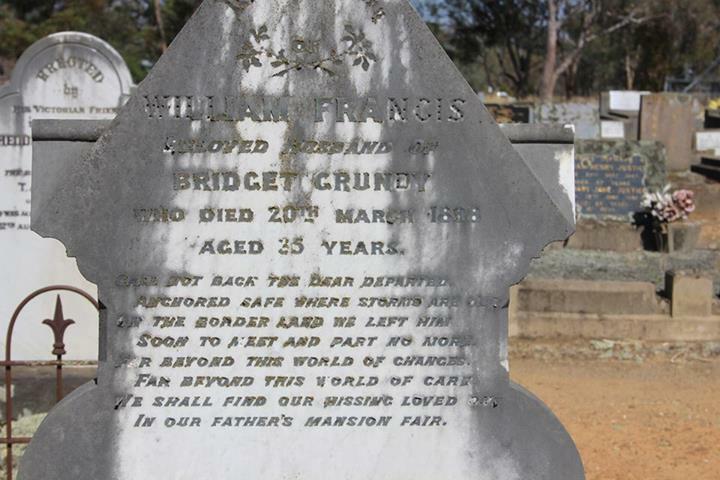 Grave Stone of Constable William Francis GRUNDY – Holbrook Cemetery, NSW. The constable was critically injured when he fell from his horse about 18 miles from Holbrook on the 15 March, 1898. 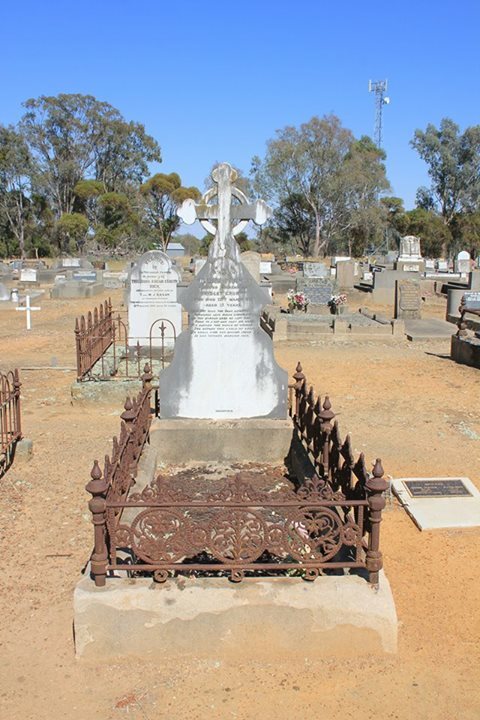 He was later found by the Tarcutta mailman and taken to Holbrook in an unconscious condition, where he passed away on the 20 March 1898. The Argus newspaper of 1 April, 1898 carried the following brief story. ALBURY, Thursday. An inquest was held yesterday at Germanton into the circumstances attending the death of Constable Grundy, who succumbed to injuries received by a fall from his horse. Allegations were made that the Deceased was compelled to ride a horse which had fallen with him on other occasions. The evidence of the officer in charge of the Germanton Station to a great extent bore out the allegations. He stated that the horse was notoriously unsafe, and that Grundy had complained that it would break his neck some day. When advised to report the animal he said that it was no use doing so as he would only get another just as bad. Deceased was thrown off the horse while proceeding at night along a road beyond Germanton, he then being in search of sheep stealers. The superintendent of police gave evidence denying that the horse was unsafe. He admitted that the horse was timid and required careful handling. A verdict was recorded that Deceased met his death by injuries received by being thrown from his horse. At the time of his death the constable was stationed at Germanton (now Holbrook).